Doing everyday shopping and paying through debit and credit cards have never been more rewarding as Cebu Pacific GetGo, together with UnionBank and its new fleet of cards, gives cardholders the chance to earn free flights, faster, using rewards points earned from swiping. Five personalities, including actress-turned entrepreneur Bettina Carlos and TV host Suzi Entrata-Abrera, have experienced the rewards of shopping with GetGo and UnionBank when they took on the “Swipe-a-thon Challenge”. Using their co-branded Cebu Pacific GetGo Visa Credit Cards by UnionBank, the participants raced along grocery aisles to buy various items, including travel-related ones—and be the first to reach the highest number of GetGo points upon check-out, without exceeding the P10,000 budget. 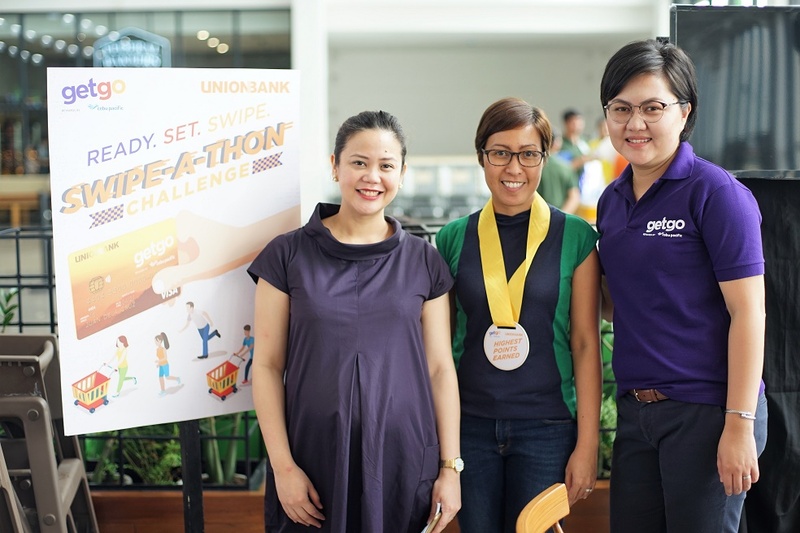 Swipe-a-thon Challenge winner Trixie Mendoza of Yummy.ph (center) is joined by Unionbank Visa Marketing Manager Tricia Apostol (left) and Cebu Pacific Air Campaign Manager for Loyalty Division Elia Soon. The challenge enabled the participants to experience earning GetGo points from both grocery and travel-related spend which allows them to redeem free flights to local and international Cebu Pacific destinations. “Our Swipe-a-thon challenge showcased how members’ shopping for everyday essentials can be turned into free Cebu Pacific flights using their UnionBank cards and GetGo. With Cebu Pacific’s GetGo Visa debit and credit cards, the money you spend truly does go further as far as Cebu Pacific can take you—for free!” said Nik Laming, GetGo Loyalty Division general manager. Cebu Pacific GetGo Visa Debit and Credit Cards by UnionBank are the only cards that directly earn GetGo points and are automatically credited to a cardholder’s GetGo account. Cardholders of Cebu Pacific GetGo Visa and Platinum Credit Cards by UnionBank will also enjoy earning GetGo points at one of the best earn rates in the market, 1 GetGo point for every P30 spent. Ready, set, swipe! Media participants with celebrity host Suzi Entrata-Abrera (second from left) and actress-turned entrepreneur Bettina Carlos (center) take on the Swipe-a-thon Challenge to experience the rewards of shopping care of GetGo and UnionBank. Exclusive benefits such as priority check-in at select airport terminals, an additional 5kg baggage allowance, complimentary airport lounge access to the Skyview Lounge at NAIA Terminal 3 and the MAISCOR Lounge at the Davao International Airport, as well as free travel insurance, are some of the perks offered to Cebu Pacific GetGo Visa Platinum Credit cardholders. Cardholders are also entitled to exciting Cebu Pacific benefits which include early alerts to Cebu Pacific seat sales, exclusive promos on seats, and GetGo points sales. Indeed, GetGo and UnionBank’s new fleet of cards, make daily spending transactions the easiest and most convenient way for every Juan to fly for free to Cebu Pacific destinations. So, hurry! Start earning GetGo points and #FlyForFreeFaster! Visit getgo.unionbankph.com to apply for a Cebu Pacific GetGo Debit or Credit Cards by UnionBank.